TAMPA, Fla. – In the moments before the ball is snapped, Jordan Dowrey can look to his left or right and see the familiar. For the past 21 games, Dowrey, the offensive line's only senior, has started at left guard in between sophomore left tackle Will Ulmer and junior center Levi Brown. It is expected. The challenge for the Marshall offensive line in Thursday's Bad Boy Mowers Gasparilla Bowl will be the unexpected. That is how South Florida and its defensive-minded head coach, Charlie Strong, like it. "They run a lot of different defenses," Dowrey said of the Bulls, the Thundering Herd's opponent for the ESPN television broadcast. "There's a lot of fronts; a lot of movement. Those are the sort of things an offensive lineman has to identify and be on the same page across the board." Marshall's line has that going for it. The quintet of Ulmer, Dowrey, Brown, right guard Cain Madden and right tackle Tarik Adams have started a combined 137 games. That line – one senior, one junior and three sophomores – have started the last eight games together. 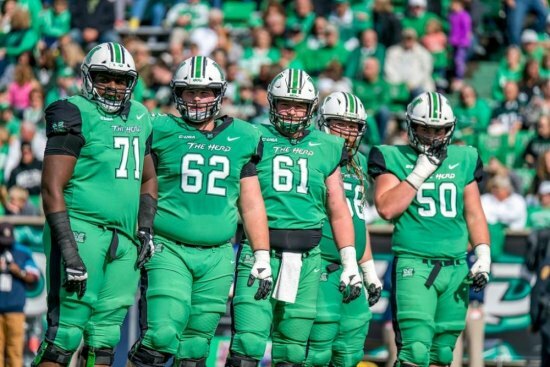 "Our offensive line continued to get better through the year," Marshall offensive line coach Greg Adkins said after the team's final pre-bowl practice Tuesday morning. "Obviously, we had some guys who had played some games here, but we were still relatively young. The future is bright in terms of that position." Madden entered the starting lineup in October after sophomore Alex Mollette was lost for the season with an injury. Since then, the starting five has been the same, which has helped the offense handle two different starting quarterbacks and four different lead running backs during that span. "If you have continuity, you should be better because you're working together and seeing things together and communicating together," Adkins said. "We ran the ball pretty well except for two games." That, Adkins said, is a credit to Brown, who has 36 career starts with another season of eligibility remaining. If the instability at other positions bleeds into the o-line room, it is because of any changes at quarterback. Brown helped ease those transitions – first from freshman Isaiah Green to first-time FBS starter Alex Thomson, then back to Green – by bringing a veteran presence and the ability to communicate. Brown was a Conference USA all-conference selection this month. "Levi has seen a lot," Adkins said. "He's one of the most experienced players we have up front and he's playing a position that requires a lot of knowledge, and he has really helped our quarterbacks." Communication will be paramount when Marshall (8-4) meets USF (7-5) at 8 p.m. here inside Raymond James Stadium. Strong has a long history as a defensive guru, first as a coordinator at South Carolina and later at Florida, where he coached alongside current MU coach Doc Holliday. Strong has been known for variations of a 3-3 stack defense, although it is one of many looks the Bulls will give the Herd on Thursday night. "This is a typical Charlie Strong defense," Adkins said. "Multiple … will play four down, three down, bear and what we call three-down spacing with four-down personnel. They have all the pressures: boundary pressures, field pressures and middle pressures. Their overall team speed on defense will be a big challenge for us." USF ranks No. 104 in total defense and No. 122 in rush defense, but the ability to create chaos is still there. The Bulls rank in the top 50 nationally in sacks, tackles for a loss, interceptions and fumbles recovered. The Herd's veteran offensive line has the experience for what they know will be a big challenge. "We pretty much have two years under our belt as a unit," Dowrey said. "That has led to really good communication."